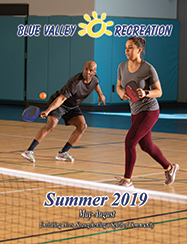 The Blue Valley Recreation Commission (BVRC) was formed in August 1986 by a concerned citizen group to address the shortage of recreation opportunities in the area. The BVRC was formed under the auspices of the Blue Valley School District and its patrons are the primary focus of our recreation programming. The BVRC operates under the direction of the Kansas Statutes Annotated 12-1922 through 12-1935 along with a seven person policy-making board that is appointed by the Blue Valley School District Board of Education. Blue Valley Rec has a strong partnership with the Blue Valley School District. School district facilities are used by a variety of BVRC activities including youth basketball, dance recitals and special populations. BVRC activities are centered at three Overland Park facilities: the Activity Center at 6545 W. 151st Street; the Recreation Center at 7720 W. 143rd St., and the Sports Complex at 9701 W. 137th Street. The Activity Center includes classrooms, a gymnastics center, an indoor aquatics facility, and an outdoor play area. The Recreation Center includes an indoor walking/running track, fitness equipment, weight training equipment, a dance studio, fitness workout rooms, and indoor court space. The Sports Complex is nestled near a wooded area and includes 24 baseball/softball fields, batting cages, sand volleyball courts, two picnic shelters, two climbing rocks and two children’s play areas. Currently, Blue Valley Rec has a paid staff of about 55 regular full-time and hundreds of part-time employees. These professionals plan, organize, orchestrate, and maintain BVRC programs and facilities. The quality and supervision of these programs, however, could not be maintained without a large cast of dedicated volunteers. Each year, approximately 1,400 volunteers give 120,000 plus hours of their time by serving on advisory committees, assisting at events, and as instructors, coaches and leaders.